The great end of life is not knowledge, but action. What men need is as much knowledge as they can organize for action; give them more and it may become injurious. Some men are heavy and stupid from undigested learning. This preservation of favourable variations and the destruction of injurious variations, I call Natural Selection, or the Survival of the Fittest. Variations neither useful nor injurious would not be affected by natural selection and would be left a fluctuating element. From Origin of Species (fifth edition, 1869), 81. The phrase “survival of the fittest” was not added until the fifth edition (1869), and is absent from earlier editions. Also in the fifth edition, the word “destruction” replaced “rejection” used in the earlier editions (1859, 1860, 1861, 1866) to the fourth edition. 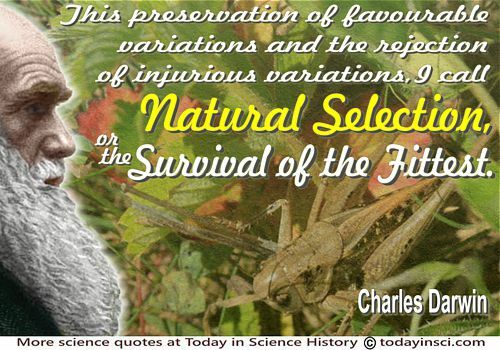 This preservation of favourable variations and the rejection of injurious variations, I call Natural Selection. Variations neither useful nor injurious would not be affected by natural selection and would be left a fluctuating element.